To inspire the highest type of womanhood. Gamma Phi Beta (ΓΦΒ) is an international sorority that was founded on November 11, 1874, at Syracuse University in Syracuse, New York. The term "sorority," was coined for Gamma Phi Beta by Dr. Frank Smalley, a professor at Syracuse University. 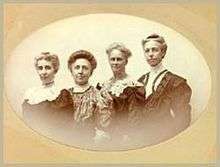 The four founders are Helen M. Dodge, Frances E. Haven, E. Adeline Curtis and Mary A. Bingham. The sorority's international headquarters are located in Centennial, Colorado. Gamma Phi Beta currently has more than 200,000 initiated members, 130 chartered collegiate chapters and more than 155 alumnae groups across the United States and Canada. Gamma Phi Beta's primary objective is to inspire the highest type of womanhood. Colleges and universities admitted few women students in the 1870s; some administrators and faculty members argued women had inferior minds and could not master mathematics and the classics. Regardless, Dr. Erastus Otis Haven, Syracuse University chancellor and former president of the University of Michigan and Northwestern University maintained that women should receive the advantages of higher education and enrolled his daughter, Frances, at Syracuse. After considering an invitation to join the then two-year-old Alpha Phi Fraternity, Frances instead asked three friends to assist her in organizing their own society. They sought the advice and help of Dr. Haven, their brothers, the faculty and members of two existing fraternities. Gamma Phi Beta was subsequently founded by Helen M. Dodge, Frances E. Haven, E. Adeline Curtis and Mary A. Bingham on November 11, 1874, at Syracuse University. The women had originally selected the colors light and dark blue but changed them in 1875 to brown and mode (dark and light brown) in honor of Dr. J.J. Brown, whose study was used for Friday afternoon meetings of Gamma Phi Beta. The first initiate, Clara Worden, joined in March 1875. Gamma Phi Beta is a member of the Syracuse Triad, the name given to the three women's sororities founded at Syracuse University. Alpha Phi was founded first in 1872 by 10 of the original 20 women admitted into Syracuse University. Gamma Phi Beta came along two years later in 1874 and Alpha Gamma Delta completed the triad in 1904. The three sororities maintain a bond, and Syracuse Triad ceremonies or events are held on most campuses with chapters of all three groups. Frances E. Haven went on to assist in founding Omicron Chapter at the University of Illinois. Omicron is the only other chapter founded by one of the original founders. Frances E. Haven Moss is also buried in a cemetery on campus at the University of Illinois. Gamma Phi Beta's symbol is the crescent moon, while the flower is the pink carnation. The official colors of Gamma Phi Beta are brown and mode (dark and light brown). Mode can also mean "the style of the day", establishing how brown and pink are now in widespread use in Sorority branding and marketing materials. In October 1875, the color was changed to honor another gentleman who had assisted them in their earliest days together. Dr. John J. Brown, a professor at Syracuse university. Gamma Phi Beta's official stone is a pearl. The carnation was named the official flower at Convention 1888. Pink was designated the official color of the carnation in 1950. Carnations have been revered for more than 2,000 years as one of the most long-lasting flowers. Many varieties produce a clove-like scent, and the aroma is said to be both uplifting and motivating. The legend of pink carnations says they first appeared on earth from the Virgin Mary’s tears – making them the symbol of a mother’s undying love. 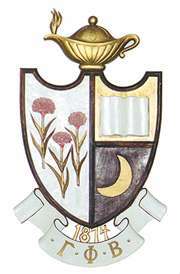 The Gamma Phi Beta badge has not significantly changed since its design in 1874. It was designed by Tiffany & Co. It features a black crescent moon cradling the Greek letters, Gamma, Phi and Beta. Badges are currently produced by jeweler Herff Jones with options for gold or silver, jeweled or not. The badges worn by International Council members are larger and feature white crescent moons instead of black. The international president's badge is set with diamonds on the Greek letters; other international officer's badges are set with pearls. In 1902, a badge for uninitiated members was approved (a triangular-shaped shield of dark brown on which rests a crescent of yellow). Every initiated member has a lifelong membership to Gamma Phi Beta with the opportunity to participate in alumnae activities on the local, regional and international level. Women who have never belonged to a National Panhellenic Conference sorority may be eligible to join Gamma Phi Beta through the alumnae initiate program. Once a woman is initiated into Gamma Phi Beta she is no longer allowed to join any other National Panhellenic Conference sorority. One main duty of being a member is paying dues each semester during her college years and once she graduates paying a yearly due to International Headquarters. The sorority has a long history of community service and philanthropic participation. In 1929, camping for girls was designated the official philanthropy of Gamma Phi Beta and the organization supported Camp Fire and Girl Guides of Canada. Since 2001, more than $400,000 has been donated to Camp Fire USA and its local councils. Local chapters of Gamma Phi Beta support other philanthropies as well. At Convention 2012, a new philanthropic focus was adopted: "to provide experiences and resources that build spiritual, mental and social resiliency in girls." To reflect this, the sorority announced its partnership with a third organization: Girls on the Run which is nonprofit organization that inspires girls to be joyful, healthy and confident using a fun, experience-based curriculum that creatively integrates running. In 1891, Gamma Phi Beta was among the founders of National Panhellenic Conference (NPC) at the organization's first session in Boston. Participants included Kappa Kappa Gamma, Alpha Phi, Delta Delta Delta, Delta Gamma, Gamma Phi Beta, Kappa Alpha Theta and Pi Beta Phi. Today, NPC includes 26 sororities united to "promote the values of and to serve as an advocate for its member groups in collaboration with those members, campuses and communities." Each member group has the opportunity to serve a two-year term as chairwoman of NPC only once every 52 years. In the history of NPC, three Gamma Phi Beta's have had this honor: Lillian Thompson (Beta Chapter), 1912–1913; Beatrice Locke Hogan (Nu Chapter), 1955–1957; and Elizabeth Ahlemeyer Quick (Beta Phi), 2005-2007. Karen Holbrook (Gamma) - Past president of Ohio State University. Kristin Chenoweth (Beta Omicron) - Tony Award and Emmy Award winning actress. Heather McDonald (Beta Alpha) - Actress, comedian, writer best known for Chelsea Lately. Elizabeth Pitcairn (Beta Alpha) - Famous concert violinist, plays the famous violin on which the Academy Award winning film, The Red Violin was based. Bailey Hanks (Zeta Zeta) - Broadway actress (Legally Blonde). Susan Howard (Alpha Zeta) - Actress (Dallas). Cloris Leachman (Epsilon) - Actress, Academy Award winner. Kelli O'Hara (Beta Omicron) - Actress, Tony Award winner for The King and I.
Mary Beth Peil (Epsilon) - Tony Award nominated singer and actress (Dawson's Creek). Hope Summers (Epsilon) - Actress (The Andy Griffith Show). Jocelyn Burdick (Epsilon) - North Dakota governor appointed her to US Senate seat held by her late husband in 1992. Lane Carlson (Alpha Delta) - Former head of Public Affairs of US Army; First woman to be named full Colonel in Army (1968). Laurel Clark (Gamma) - NASA Astronaut on the space shuttle Columbia. Jeannie Deakyne (Alpha Epsilon) - Mrs. U.S. Beauties 2008, Mrs. Texas International 2005 and Bronze Star Medal recipient. Jennifer Dunn (Lambda) - Former U.S. Congresswoman ('93-'05) - WA 8th District. Lynn Morley Martin (Omicron) - Secretary of Labor under President Bush. Carol Ryrie Brink (Xi) - Author of Caddie Woodlawn and winner of the Newbery Medal in 1936. Alex Flanagan (Alpha Epsilon) - Sports reporter for ESPN, NFL Network, and NBC. Marguerite Higgins (Eta) - UC Berkeley, Pulitzer Prize winner in 1951. Lauren Sinclair (Delta Omega) - United States Sailing Team Member, Olympic Sailing Campaigner and ISAF World Cup of Sailing Participant . ↑ "Sorority Symbols". Gamma Phi Beta. Retrieved 2010-05-11. ↑ "The History of Syracuse University Fraternity and Sorority Community". Syracuse University. 2010. Retrieved 2010-05-11. ↑ "Membership". Retrieved February 22, 2016. ↑ "Syracuse Triad". Retrieved 2009-10-14. ↑ "1875: The Colors • History of Gamma Phi Beta". gammaphibetahistory.org. Retrieved 2016-06-13. ↑ "Gamma Phi Beta Membership". Gamma Phi Beta. Retrieved February 22, 2016. 1 2 3 4 5 6 7 8 9 10 11 12 13 14 15 16 17 "Prominent Gamma Phi Betas". Gamma Phi Beta. Retrieved 2010-06-08. ↑ "Member to shine in Broadway musical". Gamma Phi Beta. July 23, 2008. Archived from the original on April 24, 2009. Retrieved 2008-10-19. ↑ "Spotlight On: Life Abroad". The Crescent of Gamma Phi Beta. July 1, 2005. Archived from the original on April 24, 2009. Retrieved 2008-06-24.